Failing to prosecute Assad will be the death of the International Criminal Court. The failure to prosecute him will be the end for the ICC’s brand of global justice. 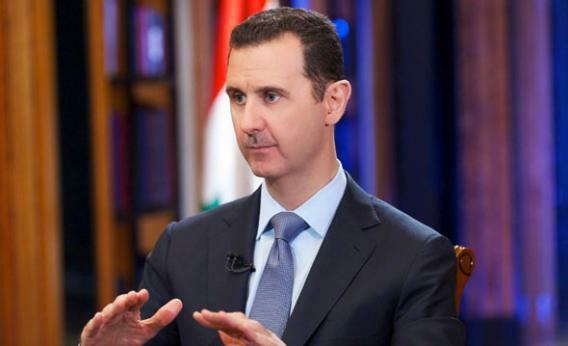 Syrian President Bashar al-Assad speaks during an interview with Fox News in Damascus on Sept. 19, 2013. Numerous commentators argue that Syria’s President Bashar al-Assad should be tried for war crimes before the International Criminal Court. If anyone ought to be prosecuted for war crimes, it’s this reviled leader, who almost certainly directed poison gas attacks against civilians. But as Joshua Keating explained in Slate, it’s not going to happen. This, just the latest blow to the ICC, illustrates once again why the prospect of international justice through global courts is ever receding—and why the court’s own days may be numbered. The idea that dictators who cause wars and kill civilians should be tried and punished is a modern one, but it has roots in the distant past. Armies always believe that their cause is just and thus that the enemy deserves punishment. When the Mongol ruler Timur defeated Bayezid I of the Ottoman Empire in 1402, Timur allegedly had Bayezid paraded around in a cage and used him as a footstool. As civilization advanced, however, rulers increasingly were not held personally liable for war-making and its attendant atrocities. Napoleon was confined to Elba and St. Helena not to punish him for war crimes but to prevent him from starting wars in the future. After World War I, this thinking began to change. The victors planned to prosecute Kaiser Wilhelm II for war crimes but abandoned this idea, using the excuse that Holland of all places refused to extradite him. Maybe the victors were intimidated by his impressive mustache, but more likely they preferred to blame Germany as a country and force it to pay reparations (a ruinous decision that seeded the malign flora of Nazism). The winners of World War II did not repeat this mistake. The Germans were not held collectively responsible for Nazi atrocities. Instead, the worst of the bad guys were tried at Nuremberg and in Tokyo. But the postwar proceedings faced a problem. Hitler’s and Tojo’s invasions of innocent countries—and even Hitler’s massacre of civilians at home—did not violate any rule of international law that came with personal criminal liability. Leaders were tried and punished nonetheless, but doubts about legitimacy lingered, since the trials lacked a basis in international law even while they condemned defendants for violating it. After the Cold War, the idea of prosecuting warmongers was revived. The civil war in Yugoslavia and the genocide in Rwanda spurred the U.N. Security Council to establish two tribunals to try participants for international crimes. These tribunals rested on a somewhat firmer legal basis than Nuremberg and Tokyo. Yugoslavia and Rwanda had given theoretical consent to Security Council authority decades earlier and so could be considered bound to its resolutions. Still, the Yugoslavia trial could be seen as victor’s justice—an impression reinforced by the fact that the tribunal was deprived of authority to try any Westerners who committed war crimes, such as NATO pilots who dropped bombs on civilians. Serbians in particular claimed that the tribunal was biased against them. The ICC was meant to put an end to the cycle of doubt. The rosy vision was that all countries would voluntarily submit to its jurisdiction, so no single country could claim that it would be singled out for victor’s justice. The logic is similar to the logic behind arms-control agreements: I concede that chemical weapons are bad, but I will not give up my chemical weapons unless I’m sure that my possible enemies will give up theirs as well. International cooperation is a delicate business in which all the protagonists gradually lay down their knives while keeping an eye on one another to ensure that no one gains a slight advantage by laying down his knife more slowly than the others. So when the United States, Russia, China, India, Pakistan, Turkey, and Israel all refused to ratify the ICC treaty, the court was crippled from the start. The United States feared that the ICC might pick on Americans, given that an independent body—staffed largely by foreigners—might believe that by singling out the United States, it could establish its bona fides with the rest of the world. Other countries that refused to ratify simply did not want a foreign court meddling in their affairs. They did agree that the U.N. Security Council would have the power to authorize the ICC to investigate and try anyone in the world for international crimes—a provision acceptable to the great powers because they control the council. Without the big countries as members, the ICC—which lacks its own police force—could not call on them to arrest suspects in countries unwilling to give them up. The founders of the ICC faced a bad choice. They could offer immunity to the big countries in return for their participation, thus ensuring that the ICC would be regarded as illegitimate. Or they could give up on participation by the strong countries, draining the ICC of any power. They took the second path—but ended up depriving the ICC of legitimacy as well as power. The countries that signed on were mostly peaceful democracies and poor countries embroiled in endless conflicts that could not be addressed with regular law enforcement. Because the ICC treaty specifically limits ICC involvement to cases where national legal institutions fall short, the ICC focused its attention on the latter group, which unfortunately were mostly African. In some cases, the African countries invited ICC participation, but in others it was thrust upon them. For example, the Security Council authorized the ICC to investigate Sudan, whose president Omar al-Bashir was indicted for his role in ethnic killings in Darfur. (He has refused to appear for trial.) Even a country like Uganda, which invited ICC participation, later found that as a result it could not offer an amnesty to insurgents in order to establish peace. As the ICC increasingly interfered in their affairs, African countries took the view that the court, in the words of Ugandan President Yoweri Museveni, is now being used by Western powers “to install leaders of their choice in Africa and eliminate the ones they do not like.” Meanwhile, the ICC—with an annual budget of more than $140 million and staff of about 700—has been able to convict only one person (the Congolese warlord Thomas Lubanga) in more than a decade. Things have finally come to a head. The ICC has indicted two Kenyan leaders—President Uhuru Kenyatta and Deputy President William Ruto—for their role in fomenting violence during elections in 2007. In an odd twist, the leaders have voluntarily agreed to appear in court while working behind the scenes to undermine the prosecution. Witnesses are pulling out, most likely because of intimidation or bribery. And the Kenyan Parliament has voted to withdraw Kenya from the ICC. Other African countries have taken Kenya’s side and have expressed support for Sudan’s Bashir. If Kenya withdraws from the ICC, other African countries may follow its lead. And why shouldn’t they? Why should their leaders subject themselves and their constituents to the risk of criminal prosecution if the leaders of other countries don’t do the same? Events in Syria only underscore the complaints. Assad is a more repellent fellow than Kenyatta or Ruto, yet he will escape trial because Syria never ratified the ICC treaty and the U.N. Security Council won’t refer him for prosecution. He enjoys the protection of the Russians, and the Americans now need him to carry out the chemical weapons agreement and to prevent Islamic extremists from taking control of Syria. We can’t do a deal with him and then send him to jail. And even if Assad somehow ended up at the dock in The Hague, his trial would still be seen as one more example of a poor country, in an underdeveloped part of the world, being targeted by the Western powers manipulating the ICC to their ends. The ICC is not going to start bringing cases against Sweden and New Zealand so that it looks evenhanded. And it won’t even bring cases against conflict-ridden countries like Afghanistan that are clients of the great powers for fear of provoking them, as American University professor David Bosco explains. So if the ICC stops prosecuting Africans, it will have nothing to do. It is only a matter of time before the ICC fades away.